In 2007, the Krall log barn that was located east of Schaefferstown was scheduled to be razed. This came to the attention of the Pennsylvania Log House Society and the Lebanon County Conservancy. These organizations recognized the value of preserving this barn which was built in the late 1700s. It was a double crib log structure with two thrashing floors that measure 36’ wide by 72’ long. It is typical of the log barns built by the Pennsylvania Germans that were the early settlers of this area and is the only one of its type left in Lebanon County. Howard Scharff, the owner, agreed to donate the barn to these organizations if they would arrange to have it dismantled. Dorothy Folmer recognized the value of keeping the barn in Lebanon County and donated the funds to have the barn systematically dismantled so it could be reconstructed within Lebanon County. An agreement was made in 2007 among the above organizations and the Lebanon County Historical Society to donate the barn to the Historical Society that arranged for safe storage of the dismantled barn until plans could be made and funds raised for its reconstruction. Presently, a Master Plan is being done by YSM/Rettew for the Union Canal Tunnel Park which will include provisions for the best location for rebuilding the barn within the park. 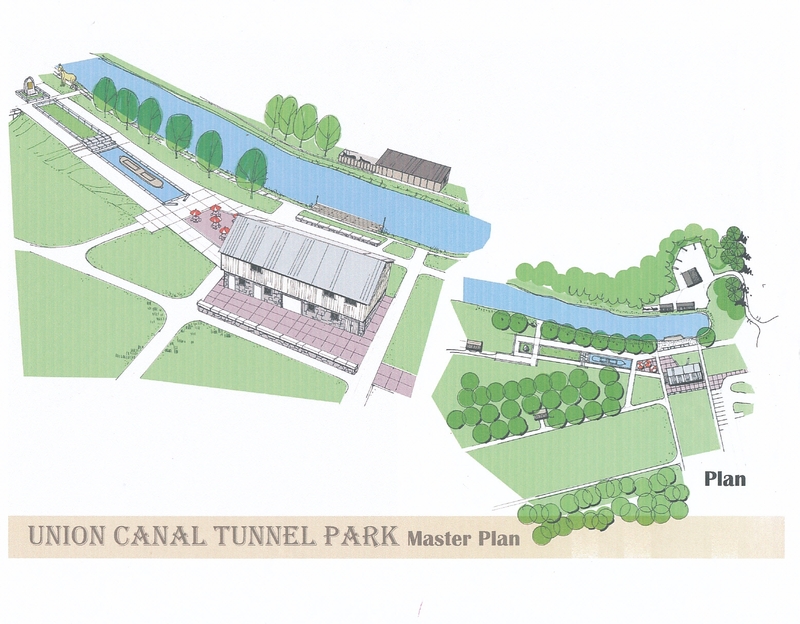 Detail of the Union Canal Tunnel Park Master Plan, featuring the Krall Barn. Help us to continue to raise the funds necessary to erect the historic Krall Barn by attending the annual Society Ball fundraiser!